southern Canada and the northeastern United States. 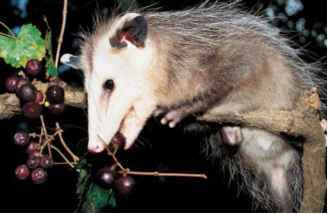 They are much more diverse in the tropical and subtropical regions between Mexico and Argentina, while only a single species, the Virginia opossum (Didelphis virginiana), extends into the United States and Canada. Because of their long period of evolutionary isolation in South America, many genera and species can only be found in that subcontinent. The genera Thylamys, Lestodelphys, one species of Didelphis (D. aurita), three of the six species of Gracilinanus (G. ace-ramarcae, G. agilis, and G. microtarsus), two species of Mar-mosops (M. dorothea and M. incanus), one of Micoureus (M. constantiae), and 10 species of Monodelphis (M. americana, M. dimidiata, M. domestica, M. iheringi, M. kunsi, M. osgoodi, M. rubida, M. scallops, M. sorex, and M. unistriata) are restricted to South America south of the Amazon river. Several species of Marmosa, Marmosops, and Thylamys are known only from the type localities, and several genera such as Caluromysiops and Glironia and species such as Gracilinanus emiliae, Marmosa rubra, and Monodelphis americana are restricted to the Amazon basin. 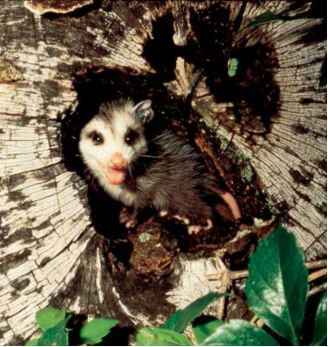 The Virginia opossum is one of the most widespread species in the family, and the only one with a distribution extending well beyond that of any other species. Virtually all other species coexist with one or more additional species of didelphids, but in all of the United States and southern Canada, the Virginia opossum is the only species present. 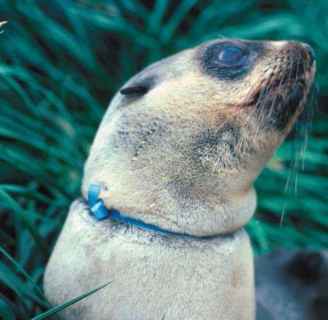 Most species inhabit tropical habitats, but a few species, remarkably in the genera Thylamys and Lestodelphys, are adapted to temperate ecosystems, and inhabit only the southern latitudes of Chile and Argentina.